Kevin Peacock is a resident and chair of Clubmoor Big Local partnership in Liverpool. Kevin presented at the Big Local spring event in Manchester in April 2015. The partnership wanted to make it clear to everyone in the area that Big Local is independent and different. They have therefore been working hard to put together a strong brand for Clubmoor Big Local, so that it can become known and recognised. Clubmoor is one of the biggest Big Local areas, with about 15,000 residents and is near Anfield in Liverpool. The area is bisected by three dual carriageways, which divide it into six parts. The result of this is that most people living there don’t really associate themselves with Clubmoor as a place and this is one of the reasons why partnership members felt that it was so important to try to get Clubmoor’s identity established. 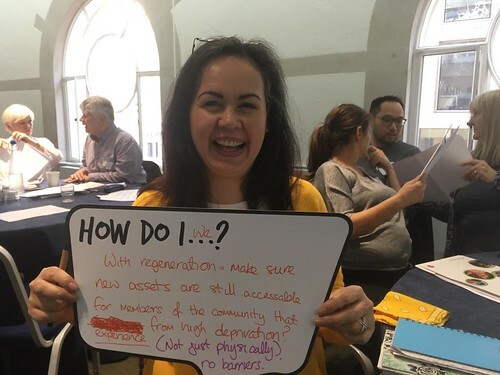 The partnership knew that it would be difficult to get people to engage with Big Local, as there have been a variety of regeneration initiatives in the past and people are mistrusting as a result. If they were going to succeed, they needed to show that Big Local is different. They wanted local residents to feel that Clubmoor Big Local is credible and trustworthy, that it belongs to them, and that it is there for the long-term. It was also really important that the partnership is visibly led by a group of residents, and not just a very few individuals. “In Clubmoor, fashion and design are cultural. People love something that looks good, they recognise it and can engage with it, so this is why we’ve gone down the branding route”. As the group thought more about it, they realised that a Clubmoor Big Local brand potentially had a lot of benefits, such as building an identity and showing Big Local is different, getting people to take it seriously, raising aspirations, helping to build trust and counteracting the negativity they were experiencing. The partnership members started to talk to people to get ideas about how they could get going. They found a professional designer with the right knowledge and expertise to help and commissioned him to work on developing the brand, explained their needs and outlined their initial ideas. The designer came up with a concept and what Kevin describes as the ‘bedrock image’, which is now the core of their brand. Their logo has lots of messages within it. The inverted pound signs represent the £1m investment available through Big Local. The heart that the pound signs create is intended to bring to mind ‘I love Clubmoor’ like the very well-known ‘I♥NY’. The partnership hopes it will help people to think positively about what they do love about their area. The partnership has taken on board the advice and guidance from the designer to be consistent. So they are careful to make sure that they always use their brand colours, layout and typeface. In this way, even if the logo isn’t there, there is something that people can recognise straight away. The designer provided them with a colour palette so that it’s easy to stick to it, and has also left them with templates that they can use to make up materials as they need them, such as flyers, posters, badges and t-shirts. Clubmoor Big Local is using their branding in everything that they do. They are coming to the end of their first year of delivering their Big Local plan and are now planning for their second year, and they are finding that people are beginning to recognise Clubmoor Big Local more. Kevin thinks that the brand has been a big part of this, together with the activities which have demonstrated that Big Local is actually doing things about the issues that matter to people locally. Kevin and the rest of the partnership have found a way to make messaging work for their local area. They see this as a way to unlock the potential in Clubmoor, so that Big Local can really make things happen. For them, branding has been a means of getting people’s attention and helping to create a real sense of good things happening in the area. The brand will stay as a constant feature of Clubmoor Big Local, reinforcing its presence and identity and continuing to help in getting people involved.